People Are Bashing Hamza Shahbaz For Laughing & Enjoying At Sahiwal Children’s House But Here’s The Truth! While the Joint Investigation Team (JIT) is busy finding the details of Sahiwal incident, social media users have other things to do. JIT is blaming CTD officials for their negligence in the operation they carried out, people are blaming Leader of Opposition in Punjab Assembly and senior political leader of PML-N Hamza Shahbaz like anything!! Why? Yesterday, a video went viral on social media where Hamza Shahbaz was seen sitting with a family along with his aides, talking to them in a very jolly mood. In a 28 seconds video, people observed how the table was loaded with food items and how Hamza was sitting with a ‘woman’. Apparently, the admin thought of the fan page that Hamza is meeting with the victims of Sahiwal incident. 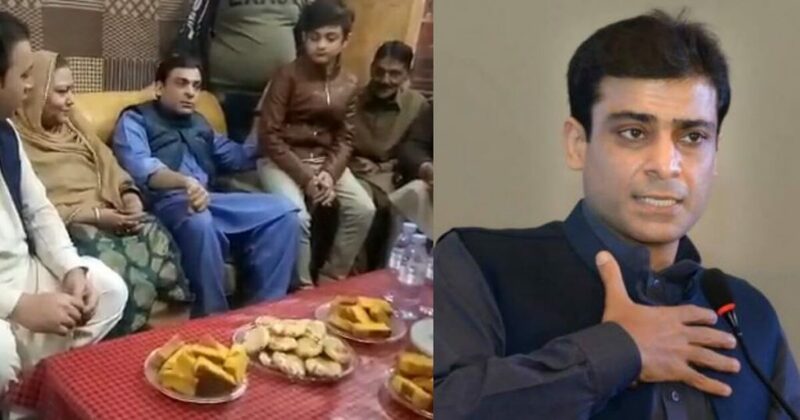 Soon after that, a fan account on Twitter of Hamza Shahbaz shared the same video with a clarification that the family was not of Sahiwal incident, he was at one of his party member’s home to congratulate him for his marriage. So, PTI VS PML-N War Set Social Media On Fire! Supporters Of Hamza Shahbaz Are Sharing More Videos! Hamza Met The Family Of Sahiwal Incident As Well, Here Is The Actual Video! PML-N Supporters Are All Over The Social Media! Junaid sb apki eyes pr PTI ke jothy media cell ki gatia propaganda ka asar pra howa h..
Ap se esy galt or fake news ki tawaqa ni thi..
Hum apko daily show dekhny or pasnd krne waly h..
Mgr apko Hamza Shahbaz ke khalaf jhothi post ni krni chahie thi..
PTI Supporters Are Raising Some Valid Questions!